I WILL not commit myself to an agreement with all that Mr. Allen has said or all the arguments he has used in the following pages: but I am thoroughly in agreement with his main line of thought and his general contention. The question of mission policy needs to be studied far more than it has been studied in the past, with due reference to the first principles of missionary work which we find in the New Testament. He had no preconceived plan of campaign; he went where the Spirit led; he sought for the open doors; he chose the centres most suitable for the gathering of converts and the propagation of the faith: he aimed definitely at converting men and women to faith in Christ: we never find him simply preparing the ground for future conversions. Then he planted Churches which rapidly became self-supporting and self-governing. We never find St. Paul governing a Church by means of workers paid from foreign sources. In about six months he has founded the Church, taught the converts the necessary elements of the faith, ordained a ministry and made provision for the administration of the sacraments. Then St. Paul passes on elsewhere, and the Church is left to grow by the power of the Holy Spirit. He occasionally visits it, writes to it and sends to it his fellow-workers; but in no case does he settle down to govern it as a modern missionary governs his district in India or China. Again, in his teaching St. Paul is content to lay simple and strong foundations. He does not attempt to give it the elaborate teaching which is thought necessary in a modern mission. The teaching given to a modern candidate for Holy Orders in the mission field finds no parallel in the work of St. Paul. Once more in the exercise of discipline, St. Paul strives to inspire a spirit, not to enforce a law. He carefully abstains from imposing upon his Churches any external code or authority. His object is not to compel them to obey a law, but to lead them to obey the inner guidance of the Holy Spirit. Then, lastly, his ideal of unity is essentially spiritual. It is not based upon organization, but upon life. He makes no attempt to bind them all into one by any centralized organization or by obedience to a common authority, but by the power of one spirit and one life. faith. We found Churches and keep them in leading strings for a hundred years, and even then are not within measurable distance of giving them independence. We transplant to the mission field the elaborate system of teaching and organization with which we are familiar at home. We impose discipline upon our converts as an external law and authority. 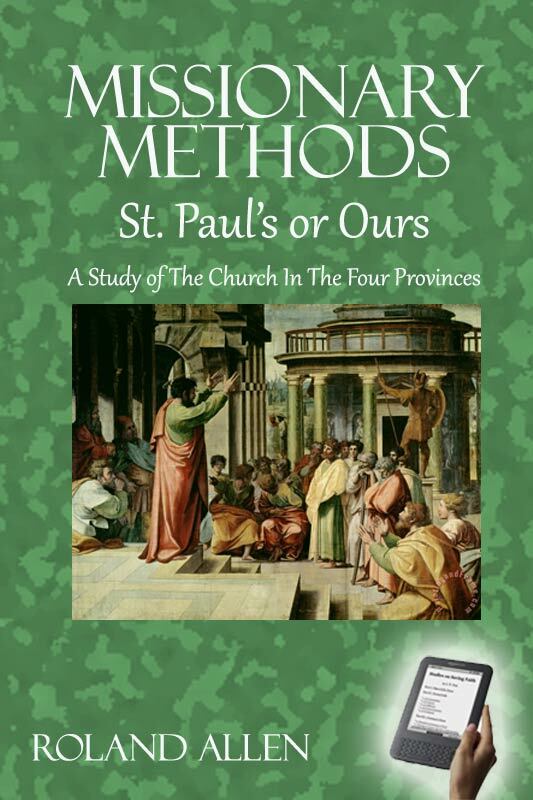 Why is there a difference between our methods and those of St. Paul? It may partly be accounted for by a difference of circumstances. But Mr. Allen maintains that this by no means entirely accounts for, or justifies, our wide departure from the methods of the Apostle; and I am strongly inclined to agree with him. At any rate, whether we agree with him or not, his argument deserves our serious consideration. The fact remains that, where St. Paul conspicuously succeeded, we have conspicuously failed. May it not be because we have worked upon widely different principles?